We're excited to announce that Constangy's Employment & Labor Insider blog has once again been named to the "Blawg 100" - the ABA Journal's annual roundup of the best law blogs from across the country. 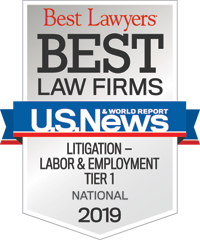 Congratulations to lead blogger Robin Shea, a partner in our Winston-Salem office for our third appearance on this prestigious list. If you are not already a regular subscriber to Employment & Labor Insider, please check us out at employmentandlaborinsider.com.